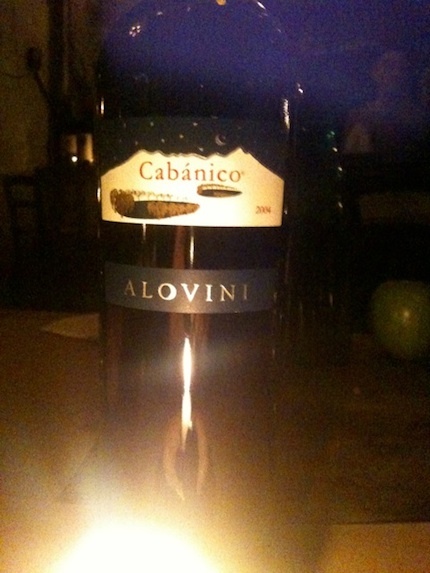 I had the good fortune to try a lovely wine at DOC in Williamsburg this weekend that I had never had: Cabanico from Alovini. I’m a Brooklyn moonie, meaning I love Brooklyn, as my dear friend Nicole would say but I do have enough sense to know a good wine when I taste one. This blend of 50% Aglianico and 50% Cabernet Sauvignon made from grapes grown on volcanic Soil in Basilicata on the slopes of Monte Vulture was perfect. A great blend of minerality, fine tannins and fruit and spice made it silky and smooth without being cloying. This wine is the work of Oronzo Alo, an enologist originally from the Salento in Apulia who has been working in Basilicata for more than 15 years. The wine spends nine months in barriques and then time in the bottle before being released but it is not at all overdone. His reduced yields, 40-60 hl/ha, are surely part of the reason that the fruit is so elegant as heavier selection leads to choosing better more phenolically ripe fruit. I am always drawn to wines that come from volcanic soils because they tend to have better minerality and sapidita’ or saline notes. Additionally, volcanic soil usually has good drainage and the fruit is almost always quite healthy. Lucania is a region that has been repeatedly in my mind these last weeks thanks to numerous great wines from the area but also to a few movies that I have seen of late. The first is Rocco e I Suoi Fratelli by Luchino Visconti. This seminal work relates the story of a mother and her four sons who move to Milan from Lucania. The fifth son already lives in Milan. An amazing portrait of a certain time in Italian history, this immigrant story can be applicable to generations of people from many cultures. The film is great also in its regional accents and at showing the differences between the North and South of Italy at the time of the movie, 1960. The second film is Basilicata Coast to Coast. It is the story of four friends who walk across Basilicata in order to go to a song contest on the other side of the region. They want to do something grand, a big gesture It’s somewhat of an “on the road tale” like Salvatores’ Tournee, part travelogue, male bonding friend movie, a love story and at the same time a love note to Basilicata. You see beautiful views of the countryside and of course meet colorful characters along the way. I saw this movie for the first time in April in Italy at the cinema. I also saw it on an Alitalia flight from Italy last week. It’s a small movie, a slice of Italian life, but one I really enjoyed and highly recommend. What’s Going on with Italy? Nothing New.